The first decade of the 20th century was devastating for the British working class with rising unemployment. In 1902 with the demobilisation of soldiers after the Boer War there was a surge in the number of unemployed. Unemployed Committees were set up in 1903 by on one hand an alliance of Radicals and the Independent Labour Party with the National Unemployed Committee, and on the other by the Social Democratic Federation, who set up their own London committee. In the borough of West Ham in East London, the Stratford and Canning town branches of the SDF began a campaign among the unemployed. West Ham had been a centre of general socialist agitation for years. In 1897 a coalition of Radicals and socialists had formed a Labour group on the council and started advocating progressive measures like a direct labour scheme for the council works department, trade union wages for council workers, labour clauses in council contracts, the setting up of council housing, etc. After they won 29 seats in the council elections of the following year they proceeded with these schemes with the building of public baths, hospitals, council housing, electrification and sewage schemes, and an independent works department. In addition the secularist paper The Freethinker was put on open display in the libraries. As a result of these measures the churches allied with conservative elements, including ratepayers associations, to create a Municipal Alliance, headed up by prominent Nonconformist churchmen. In the 1899 elections the Alliance won 9 of the 12 wards and stayed in power until 1910. In the meantime the SDF, with Will Thorne at its head, worked to increase the number of their councillors. The alliance was itself forced to introduce relief programmes and set up a Distress Committee because of the rising levels of unemployment and the mobilisations that were happening. The SDF unemployment campaign began in winter 1904 with a house to house distribution of bills, weekly open air meetings at The Grove and a mass meeting at Stratford Town Hall with the tamest of the SDF speakers, Hyndman and Lady Warwick. However, other forces were at work in West Ham, far more radical and revolutionary than the SDF. The anarchist agitator Charles Mowbray had been living in the borough at off and on from at least 1901 according to the census of that year, and he had much experience of agitation amongst the unemployed. Mowbray organised the West Ham Unemployed Committee with other anarchists like Tom Hare, an unemployed painter. As a militant who had been often victimised Mowbray was frequently unemployed himself and could speak passionately about his own situation and that of so many others. He was involved in agitation in the north of the borough of West Ham in December 1904. A heavy fog had descended on the area and lasted a fortnight, aggravating the employment situation with the laying-off of many dockers. At a meeting on December 17th at the town hall addressed by Herbert Gladstone, a deputation led by the SDF members and local union activists, Arthur Hayday and Jack Jones (who incidentally both ended up as Labour MPs , before which they had both supported the First World War) insisted on a conference with the speakers present. The situation became acute a few days later with a number of working class families becoming destitute. Hayday and Jones organised a procession to protest at places of worship in West Ham on Christmas Day, but they were threatened with arrest if this was carried out. . The local Liberal candidate for West Ham North C.F. G. Masterman then met with Hayday, Jones and Charles Mowbray at the Liverpool Street Hotel. Masterman noted that Mowbray insisted on keeping his overcoat on throughout, it then becoming apparent that he had sold or pawned his jacket because of his straitened circumstances. On 9th August 1905 after a week of open air meetings, where police, included those mounted on horse, attended, Hare, McGregor and Mowbray met with the Council and demanded a special meeting for the unemployed which was rejected by the Mayor. At a meeting at Stratford Town Hall attended by 1500 where there were speeches from Richard Bullen, unemployed carpenter, for the Independent Labour Party and McGuire for the National Democratic League, Tom Hare said that the ten to twelve thousand unemployed in West Ham would not keep quiet for much longer. They were trying peaceful measures but if they did not bring success they must try violent means. Soldiers, the police, and the landlords stood between them and the things that would satisfy their needs and cried “Hands off!” when they asked for food and clothing- but the time was approaching when the working class would say: “Never mind about hands off; if you stand in our way we shall say ‘hands on you’. Though he was an anarchist it would only be time to talk about violence when they had exhausted pacific means. If however they were not listened to, he would advocate it with all his might. (Long sustained cheering). The following week there was another fiery meeting on Friday August 25th with two of the three speakers declaring that they were anarchists. One of them, Monk, said that: “I will sail very close to the wind but not quite… All I say is that I am not afraid of prison”. As one paper reported: “through pouring rain a large number of the unemployed workmen of West Ham marched recently to the Stratford Town Hall” in October 1905. Mowbray addressed a meeting of 1,200 where “songs, recitations, and speeches were given”. It was decided that 200 “heads of family” would march to the West Ham Workhouse the following week. , and this duly happened with Mowbray at the head of the march. Mowbray said the intent was to tear down the gates and demand abolition of the Poor Law in the district and for the adoption of direct labour by the council. The campaign fizzled out but the authorities had noticed the building anger among the East London working class. As a result the ruling Alliance introduced the Unemployed Workers Act, and set up a Distress Committee. Mowbray and co. were still agitating in the following year. At a meeting in July he declared that “Working men did not own so much as a flowerpot of the ‘Glorious land’ they fought for in the African War” (The Boer War). Speaking alongside Harry Baldock for the West Ham South ILP and Teresa Billington National organiser of the Women’s Social and Political Union he talked of the current state of distress of the unemployed in Canning Town which would be likely to lead to increase in crime, together with riot and disorder. He said it was useless to vote to put Will Thorne in Parliament as that body only protected the landlords (This was an election year and Thorne, the leading SDFer in the area, was running for the West Ham South seat supported by the Labour Representation Committee). 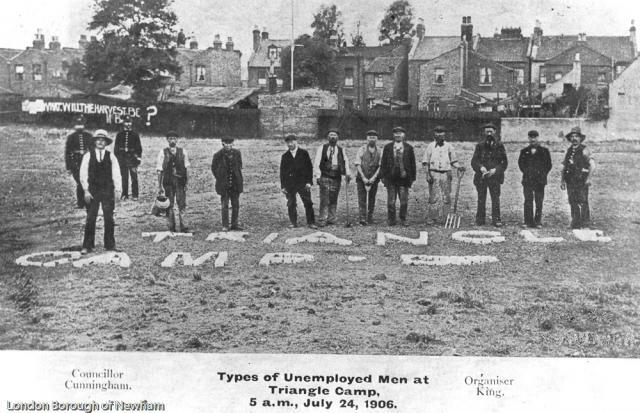 The SDF ‘s unemployed activists carried out occupations of land in northern England at Levenshulme, Salford, Bradford and Leeds, all somewhat short affairs but attracting some notice. Increasing unemployment and agitation to the left of the SDF put pressure on the SDF base itself. As the plumber Ben Cunningham, SDF councillor in South West Ham, admitted, it was discontent among the West Ham working class that pushed the SDF rank and file to take action. On Friday 13th July 1906 he and 14 unemployed workers marched on to a piece of land between St Mary’s Road and Passage in Plaistow. It lies just south of the line between Plaistow and Upton Park stations. It had been a gravel pit, later filled in with dust and refuse and measuring about 3 acres. It was unused municipal property (the previous day the Council had discussed whether to allow the Unemployed Aid Society to use the land for the unemployed but this quickly developed into a fight between two councillors over insulting remarks about the unemployed). West Ham was well under way to being urbanised but quite substantial tracts of open land still existed in the area. By the end of the day 20 unemployed were cultivating the land, and by Monday cabbages were planted. The occupiers received all in all a thousand plants from donors, including broccoli and celery. Cunningham was appointed Captain, and Bill King, chief gardener or “Minister of Agriculture. King decided the ground should be divided up into four triangular plots which gave rise to the name Triangle Camp. A structure made of canvas and poles was erected and dubbed The Triangle Hotel, manager Benjamin Cunningham. A sign was put up reading “You Are Requested Not to Spit on the Floor of This Hotel”. On July 26th the authorities turned up led by the Corporation official George Blain with a large body of police. The occupiers were supported by a crowd of three to five thousand, many of them unemployed. This was a golden opportunity for collections to be taken up by the Triangle Campers. Blain, a road foreman, asked the Campers to leave the land, but this request was turned down and Blain and Co. beat a retreat. The crowd was then addressed by Madame Sorgue (see her biography here at libcom), the French syndicalist orator and by Herbert Thomas, an SDFer who had come down from Tottenham to support the action, who exhorted it to revolution. George Bernard Shaw refused to “finance a revolution” whilst the writer H. Rider Haggard, author of King Solomon’s Mines and She, called on Cunningham to desist. As for Thorne he distanced himself from the land occupation whilst the SDF paper Justice gave it little coverage. All these so-called radicals were revealing the true worth of their expressed ideas. In late July Justice Bicknell granted the Mayor of West Ham writs against the Land grabbers. On August 4th Blain and other officials returned with a large body of police, and started clearing the camp. Cunningham refused to leave and was carried off after which the other Campers left the. The Hotel was pulled down and put in the adjoining field, where the men had gathered, along with their bedding. A second group of men then occupied the land, but fled with the return of the police at night. On September 4th Cunningham and others tried to go back on the land again but 120 police, ten of them mounted, along with 30 council officials, stopped this and only Cunningham and three others got onto the land, where they were wrestled to the ground. Cunningham for his part was sent down for contempt of court and stayed in Brixton prison until he apologised and was released on October 11th. George Pollard, of Plaistow, a gardener of 35 years was charged with assaulting Blain by striking him on the face on Tuesday September 4th. Thomas Evans was accused of assaulting Alfred Robert Taylor, a Corporation clerk on the same day. George Pollard and Thomas Evans appeared at West Ham Police Court. Pollard was arrested by constable Greenwood and was reported to have said: “I did not give him half enough. I went on to the field with the intention of stopping there. If all those who had promised to go on the land had gone, we should have stopped there”. In court he refused to take off his hat, and it had to be removed by the police. He stated that he was an anarchist-communist, that he had been looking for work from morning till night without success, that he had six children , yet could get nothing from the Corporation and that: “While we have capitalists, be they Christian or otherwise, we are bound to have distress”. The Court chairman replied that he “really could not listen to this rigmarole. You are charged with an illegal act. Can you say anything to justify it?” Pollard asked him not to interrupt so much. The chairman went on to say that “this sort of thing” must be put down to which Pollard replied “you won’t put it down”. Pollard was sent to prison for 6 weeks hard labour. The bench expressed sorrow for his wife and children to which Pollard riposted: “I take your sorrow for what it is worth”. Evans was fined twenty shillings or fourteen days imprisonment in default of paying the fine. Cunningham was disowned by the SDF. He ran again for the council elections as an independent Labour candidate, but came a poor third. He was never again elected. As Martin Crick says in his history of the SDF: “The SDF had been willing to take advantage of the efforts of its local activists but once the attempts proved abortive the Federation returned its gaze to the national arena”. “The lesson is the strength of the pressures, inherent in even the most militant trade unionism, towards accommodation with capitalism. Concern for organisational stability leads to caution in policy and action; committed to caution, the leadership develops a manipulative attitude towards the rank and file; ‘socialism’ is relegated to the rhetoric of the conference platform, a goal of the distant future, typically interpreted in gradualist terms which do not threaten the capitalist social order; militant action by the membership which might disturb established relations with employers and governments is opposed and if possible suppressed. Only a clear understanding of these tendencies and commitment to a revolutionary alternative can provide an effective safeguard against such degeneration”. The first decade of the 20th century was an important one but little research has been carried out on the workers’ movements of those years, unlike for previous decades which are now fairly well covered. The unemployed actions smashed the stigma of the undeserving unemployed to some extent, where it was their fault that they were out of work. The year 1906 saw the Liberals sweeping to power, along with a whole group of Labour MPs. These prove to be timid in the extreme and the likes of John Burns and Thorne were seen as examples of former militants who were now estranged from their original ideas. The sympathy for direct action and anti-parliamentarianism began to grow, whilst on the other hand the Labour Party became a part of the political scene and trade union leaders became more and more involved in accommodation to the Labour MPs and their Liberal allies. Crick, Martin. The History of the Social-Democratic Federation. The land that Triangle Camp was on was approved by the council for allotments in 1910, and they are still there now. I've updated the article with more information, which should become visible soon!! Great article! I'd like to see more pieces like this that tackle themes such as deservingness and unemployment. Very relevant to today.